For as long as we’ve explored the ocean, we’ve needed to know where we are. When the seafloor hydrothermal vents were first found around the Galapagos in 1977, navigation systems were still relatively primitive. At the time, few people except the military had anything like GPS, which wasn’t available for civilian use until the 1980s. But today things are different. Very different. Out here on the Pacific Ocean, 350 kilometers (220 miles) from New Zealand, the research vessel Thomas G. Thompson and ROV Jason are equipped with state-of-the-art navigation systems that provide incredibly precise location and navigation, both on the surface and below. First of all, a quick thing to note: When we talk about Jason, we are not just talking about the boxy, blue-and-yellow vehicle that explores beneath the waves. Jason is really a system that includes a bunch of other technologies that together help us study the ocean and the life within in. Part of the system is a set of technologies that allow us to navigate. That means not only knowing where the ship itself is on the ocean, but equally important, knowing where Jason and Medea are relative to the ship and relative to the ocean floor. Helping me understand some of these technologies is Jonathan Howland, a Principal Engineer in the Deep Submergence Laboratory at Woods Hole Oceanographic Institution and one of Jason’s navigators. The system starts with what’s called dynamic positioning (DP), a combination of GPS, software, and mechanical systems onboard the ship that constantly adjust the ship’s engines and thrusters to keep the ship at a fixed location or following a fixed path. It is so precise that it allows the ship to maintain its position in calm seas to within about a meter in any direction. Working hand-in-hand with dynamic positioning is a technology called ultra-short baseline (USBL) navigation. It consists of several components. One of them is a long metal pole that is lowered from the ship and extending several meters into the water. On the end of that pole is a transceiver—a device that can both transmit and receive information—as well as three hydrophones, which are basically underwater microphones. Using GPS and a shipboard gyroscope, Jonathan’s team knows exactly where the transceiver is in three dimensions (depth, latitude, and longitude) at all times. This is important. The transceiver sends coded audio pulses that travel at about 1,500 meters a second (3,355 mph—sound travels a lot faster in the water than in the air). Transceivers on Jason and Medea hear that ping and send their own ping in return, essentially saying “I’m here!”. When those pings arrive back to the ship, the hydrophones record the exact time they arrive, down to the millisecond. Since we know the speed of sound, and we know the precise time that the ping left the ship, we can calculate the exact distance to the vehicles. The problem is, while we know the distance, we don’t know the direction the return ping is coming from. This is where it gets really cool. 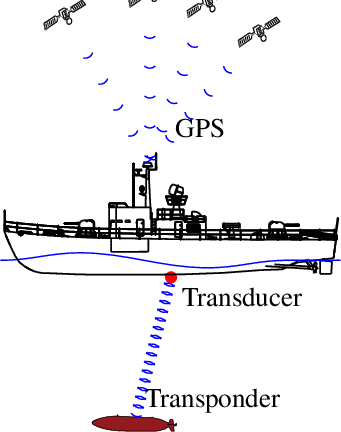 The hydrophones are spaced apart from one another at an extremely precise distance, and by measuring the exact time that the ping arrives at each hydrophone, the USBL system can, using a technique called triangulation, determine the exact direction the ping is coming from. The system—all these parts and calculations and pings happening together—can determine the vehicle’s position down to a meter, even when the vehicle is six kilometers (3.6 miles) away at the end of its tether. “That’s the part that amazes me,” said Jonathan. But wait, there’s more. All that is fine when Jason is standing still, but what if it’s moving? The pings only happen every five seconds or so because if they’re too close together the return signals start to overlap and the system can get confused. That’s too long for the pilot, who needs to know in the moment what’s going on with Jason. So at this point, another system comes into play called the Doppler velocity log (DVL), which uses a sound signal with a very precise frequency broadcast from a device on the back of Jason. Using information from a gyroscope on Jason that tells it exactly which direction the vehicle is pointed, the DVL on the ship can measure the minute frequency shift in that signal caused by Jason’s movement towards or away from us on the seafloor. It’s similar to the change in the sound of a train’s horn when it approaches and then passes by—that change can be measured and gives the train’s speed. In the same way, we can determine the exact speed at which Jason is traveling relative to us at the surface. It’s complicated, I know. But in the end, we end up the ability to say exactly where Jason is—and where we are—at any moment. And that’s important if you want to go exploring. Don’t miss a Daily Update! Sign up to receive an email when we post a new story. Completely spam free, opt out any time. Funding for the Dive and Discover™ website and its materials was provided by the National Science Foundation.